I came to know about this news when I met Siddharth Raman from cardexpert.in earlier this week. 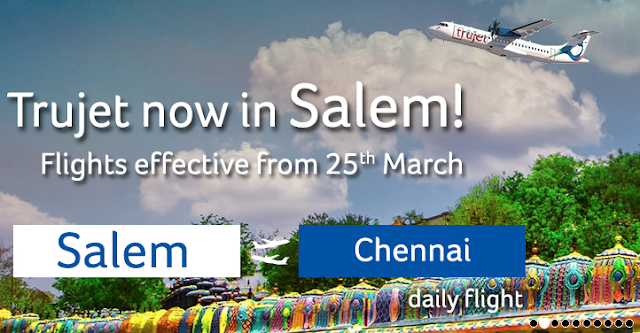 Trujet is slowly spreading its wings and has announced several new flights. Major one is flight to Salem from Chennai, which is said to commence from 25th March. The flight is of about 50 minutes duration. 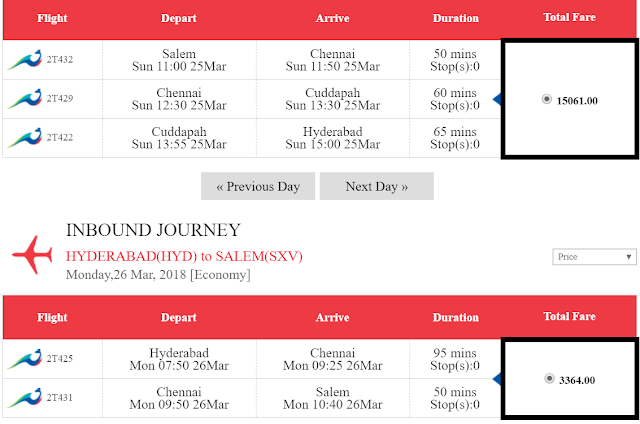 While Trujet is advertising a fare of 1499, I am guessing that is applicable only for first few seats on each flights- for most of the random dates I checked, website was showing a return fare between Chennai and Salem to the tune of 3500-4000 rupees. This may increase a bit more once flight gets popular. Salem had an airport but didn’t have any flights for sometime. Many airlines tried operating flights to Salem but had to cancel due to poor patronage. Salem is gateway to Kolli Malai, Yercaud and other tourist destinations in the area.